Rembrandt Laughing, Rembrandt’s engaging early self-portrait, is now on view in the Getty Center’s East Pavilion, Gallery 205. The jovial artist joins a range of other Rembrandt characters also on view—a pensive saint; a proud old man similarly dressed as a soldier with a metal gorget; King Cyrus and his skeptical confidant Daniel; the Princess Europa as she is whisked away by Jupiter in bull form; a contemplative bearded man, possibly a rabbi, seen in profile; and a precocious young girl in a gold-trimmed cloak. This new addition, the fifth Rembrandt painting in the Getty Museum’s permanent collection along joins a remarkable group of 10 drawings by Rembrandt. Two of the paintings on view, Portrait of a Rabbi and Portrait of a Girl Wearing a Gold-Trimmed Cloak, are on loan from private collections. 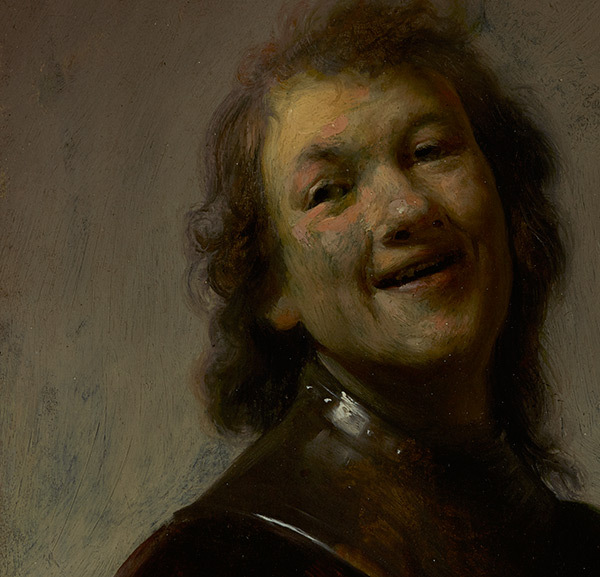 About the size of an iPad, Rembrandt Laughing commands the room among much larger–and more serious—compositions. Rembrandt was about 21 or 22 when he depicted himself relaxed and wearing military garb. He smiles broadly, revealing his teeth; his right arm is jauntily akimbo, and his hair falls fashionably in a long lock over his left shoulder. Painted with lively brushwork on copper, the self-portrait is wonderfully luminous. As paintings curator Anne Woollett notes, the painting is even more striking for its immediacy and virtuosity. Rembrandt painted perhaps as many as 80 self-portraits in his career. This work, created in Leiden and one of his first painted self-portraits, stands out for its levity—it’s one of only two in which Rembrandt portrayed himself smiling. Most of his self-portraits were more grand and serious, with a fashionable sense of decorum. For example, the only other Rembrandt self-portrait in Los Angeles is one at the Norton Simon Museum made about 1638 or 1639, which is formal with a certain gravity. His expression is serious, his body composed. His clothes are elegant, reflecting the luxurious presentation of a Renaissance portrait. Intently interested in capturing different expressions, Rembrandt etched, drew, and painted different emotions and characters throughout his career, often using himself as a model. His character studies, or tronies, were useful preparation for his history paintings, and also delightful small-scale compositions in their own right. 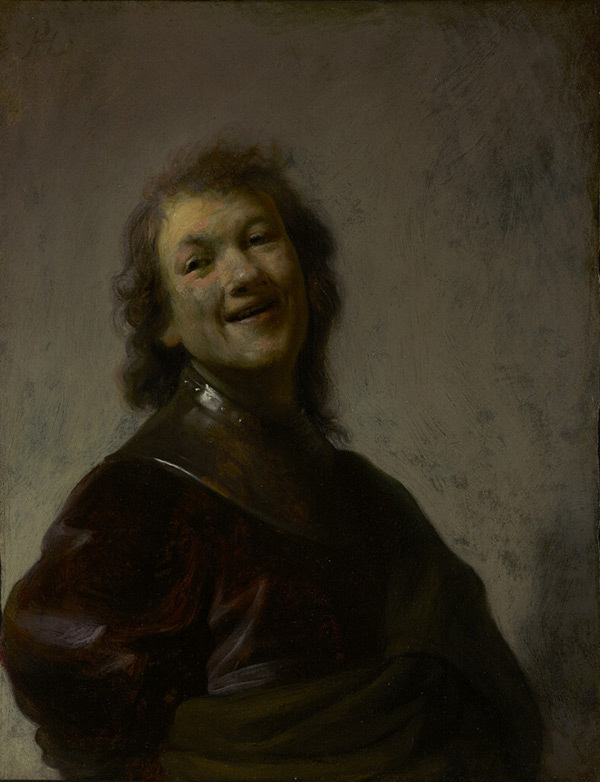 Rembrandt Laughing is both a tronie, in which the artist appears in costume and embodying a particular emotion, and a self-portrait. While we might attribute this rare jovial picture to his youthful attitude and burgeoning success at the time, it could also be considered a calling card for his skills. In the gallery, you can see how this self-portrait compares with Portrait of a Young Girl and Old Man in a Military Costume. The three were painted within a few years of each other, and together display the artist’s range and talent. All three are also extraordinary technical feats and compelling character studies, and yet each stands out, distinct in tone and emotion.